The Palm Springs Art Museum has a permanent collection of more than 24,000 objects with particular strengths in modern and contemporary art, architecture and design, and photography. Its campus, at the base of the San Jacinto Mountains, was designed by the renowned mid-century architect E. Stewart Williams and occupies a prominent site in downtown Palm Springs. In 2012, the museum opened a satellite location in nearby Palm Desert. The Galen and the Faye Sarkowsky Sculpture Garden, also called the Palm Springs Art Museum in Palm Desert, includes four exhibitions galleries, an education wing, and a four-acre sculpture garden. The Galen has the distinction of being the first new LEED Silver rated building constructed in Southern California. Palm Springs is renowned for its concentration of mid-century modern architecture, and the museum’s programs have expanded to include exhibitions and research in architecture and design. Its permanent collection even includes the house and archives of the modernist architect Albert Frey. 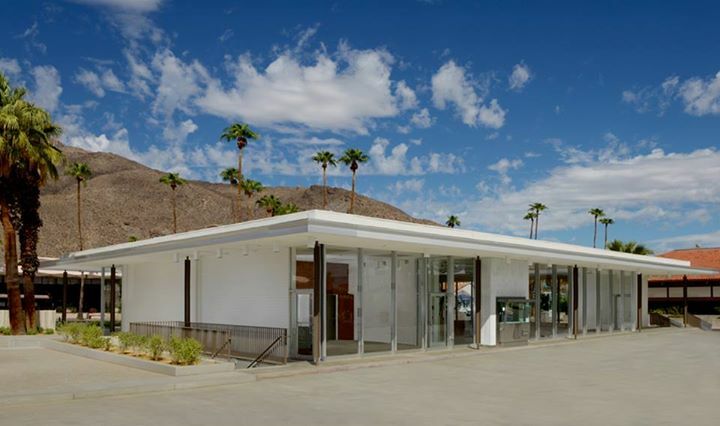 In 2011, the Palm Springs Art Museum acquired the former Santa Fe Federal Savings & Loan building in downtown Palm Springs. The 1961 structure is a classic international style pavilion, and was designed by E. Stewart Williams who also designed the main museum campus. The bank building had been vacant for several years but was protected as a historic site. The museum’s restoration removed interior walls to create a large exhibition space, but otherwise preserved the structure, including the bank vault, terrazzo floors, and exterior glass walls. The Architecture and Design Center is a significant example of mid-century modern architecture, and the Palm Springs Art Museum will develop it as the primary site for archives, research, and exhibitions related to architecture and design. In addition to these, the A+D Center’s programs are expected to broaden the museum’s audiences. The typical (retiree) demographics of Palm Springs have changed in recent years. Coachella, Modernism Week, the Palm Springs Fine Art Fair, and the Palm Springs International Film Festival cater to younger audiences with expanding interests in art, culture, and design. The museum’s Architecture and Design Council, before the new facility has opened, already numbers more than 900. 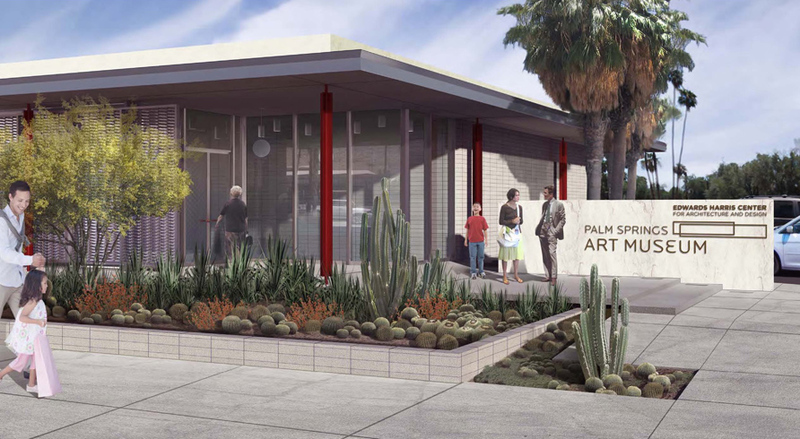 The Palm Springs Art Museum has raised $7.4 million for the Architecture and Design Center to date, with a lead gift to name the facility the Edwards Harris Pavilion, to fund the purchase and $3.8 million renovation of the building. With an expanded audience and donor base, the museum aims to create a $10 million endowment to provide annual support for the A+D Center’s operations as well as free admission.